BOSTON -- Forecasters say parts of New England could get the brunt of a snowstorm that's heading for the East Coast. The National Weather Service on Sunday issued a blizzard warning for southeast Massachusetts, including Cape Cod and the islands. 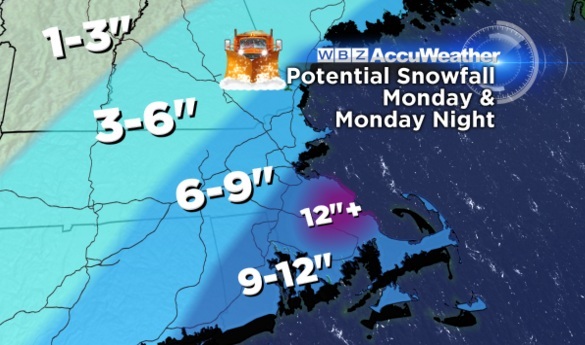 Up to 18 inches of snow could fall from Monday morning through the evening. Whiteout conditions and 40 mph winds are expected. Boston has had nearly 7 inches of snow so far this month, while Worcester is already over a foot. This coming week will be the coldest and snowiest week so far this winter, CBS Boston reports. While the majority of the snow will fall on Monday, some snow will likely be in the air Tuesday and Wednesday as well. CBS Boston reports the "jackpot" area looks to be in southeast Massachusetts, Plymouth County, and Cape Cod. CBS Boston is forecasting a conservative 6 to 12 inches there, however there may be some locally higher amounts (within the ocean enhanced snow bands) up to 18 inches. For the remainder of inland southeast Massachusetts, Boston, the North Shore, and areas inside of 495, CBS Boston is forecasting six to 12 inches as well. Farther north and west, beyond 495 into Worcester County and southern New Hampshire, snow amounts will be lower - three to six inches and tapering quickly to one to three inches into central and northern New England. The rest of Massachusetts, plus Rhode Island and eastern Connecticut, could see winter storm conditions with four to eight inches of accumulation Monday. The heaviest snowfall is expected during the morning commute through the afternoon. Public schools in Boston and Providence, Rhode Island, will be closed Monday. The weather service says New York City could get a couple inches between Monday and Tuesday night. "New York City is expecting two to four inches of snow with light snow through Wednesday, and we're urging residents to prepare for snowfall and slippery roads this week," said NYC Mayor Bill de Blasio in a statement. "While traveling, make sure to drive slowly, use major streets or highways where possible, and exercise caution when walking, biking or driving. Check in on friends, neighbors and the elderly to make sure those around you are safe and prepared for the coming snow." Last month, a blizzard with hurricane-force winds brought much of the East Coast to a standstill, dumping as much as three feet of snow, stranding tens of thousands of travelers and shutting down the nation's capital and its largest city. The system was mammoth, dropping snow from the Gulf Coast to New England. While Boston was rocked by a wild winter last year, the brunt of the January blizzard missed them. It doesn't seem like that will be the case this time around.